The MRS wonder if this is an LNWR station. If so, which one? The Signal Box looks LNWR, so that makes it likely it is an LNWR station; or a station on a Joint Railway. Sorry, cannot help any further. The station is Longton Bridge on the L&YR (former West Lancashire Railway) Southport to Preston line. 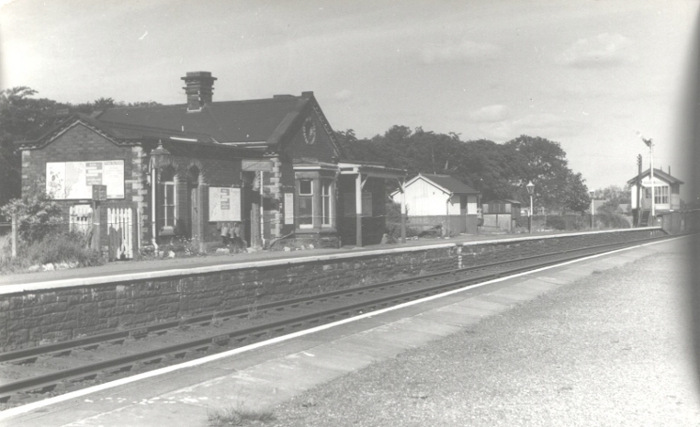 It is not safe to assume that an ex-LNWR (Type 5) signal cabin necessarily implies an ex-LNWR line, as in the years following the grouping the LMS replaced several ex-LYR cabins with those of ex-LNWR pattern. In this instance the replacement cabin dates from 1926 but was fitted with a 20-lever LYR locking frame. The line closed on September 7th 1964. Ther are more pictures here.